Planning to install the latest and greatest technology in an estate to support the security function can be a daunting task for estate and security managers. Apart from being responsible for spending an enormous amount of money and being held responsible for the installation’s performance for the next few years, one has to make decisions about what products and partners to select. Not only do you have to choose wisely in terms of the installation, you also need to make a decision regarding ongoing main-tenance and support, knowing that while you can point the finger when service providers make a mess, the homeowners’ association or body corporate is always going to point the finger at you. In times like these, it is often easy to look at the cool and expensive things in your decision-making process, the cameras, storage, kilometres of fencing and so forth. Often, decision makers tend to forget the unseen parts of the security equation. One of these less fashionable bits is the communication solution you will need to make your security system work, in other words, your network. Most of us pay scant attention to the network, after all, it’s a cable transporting data that may be video or smaller amounts of data from electric fences or access control points, and a cable is a cable. Or is it? Hi-Tech Security Solutions approached a few people in the know to ask them whether a cable really is a cable, and to find out what options there are when looking for a networking solution, or solutions for an estate. First off, we asked whether there was an optimal solution when it came to networking today, specifically when looking for a network that would not only transport video and other security data, but could also potentially link to the various residences. Naturally, fibre was a winner. Bronwyn d’Hotman Kotzen, brand manager at Datanet, says the optimal cabling solution for the whole estate would be fibre on the perimeter, gates and all connecting buildings. The advantage of fibre is that this network can also be used for FTTH (fibre-to-the-home). Tobie van Schalkwyk, business development manager at Duxbury Networking agrees. 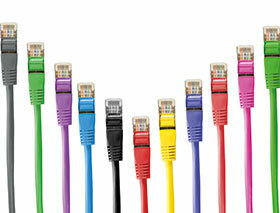 “Undoubtedly, the preferred and optimal cabling solution today is fibre optic cabling. One of the drivers is the fact that increasing demand for faster networking speeds is driving down the cost of networking equipment, supporting Gigabit and even 10 Gigabit fibre ports. Fibre is also the choice for Marco de Ru, Miro’s CTO. He says the main limitation of traditional copper cabling is that it can only support distances of up to 100 metres without repeaters. A passive optical fibre network, on the other hand, can support distances of up to 20 kilometres. Many estates support perimeters stretching over many kilometres, making fibre the only realistic and cost-effective option for the long-term. In South Africa copper theft is, unfortunately, a reality we have to deal with, adds Van Schalkwyk. Most organisations will think twice before installing a copper-based infrastructure no matter what its specifications are. In a residential estate, copper theft has the potential to reduce revenues for the estate as it diverts budget from mainten-ance to repairs and the replacement of infrastructure. In cases where estates need their network to cross roads or rivers and they don’t want large engineering projects, De Ru advises that low-latency, high-throughput wireless networks are the way to go. These will complement the speeds of fibre and can be set up quite easily to cross obstacles and ensure the whole network functions seamlessly. If fibre and wireless networks are producing such good performance without breaking the bank, can we assume there is no further requirements for copper network cabling? While installers can set up any network without copper cabling today, it is not realistic to do so. In normal houses and offices, for example, De Ru says a 100 m copper cable run is more than enough and it can support the bandwidth required for video and so forth. Copper is also naturally still used in businesses around the world where it can support data networking and VoIP (voice over IP) telephony, according to De Ru. In most cases Cat5 copper cabling is acceptable, although Cat6 is somewhat more immune to electronic interference. d’Hotman Kotzen echoes the usefulness of copper in homes and businesses, but notes that buyers should be aware of the differences in copper cables. For example, Cat5e was not designed for PoE (power over Ethernet), while Cat6 has higher operating margins. Cat6a does offer increased performance and will support up to 100 Watt PoE. She says the brand of cabling used will not necessarily impact the transmission rates, however, well-known brands will conform to all the necessary standards and offer long-term warranties because of the quality built into the cables. At the same time, she says your average end user will not be able to differentiate between good and poor cabling until they experience it in action, by which time it’s too late. The best guide to quality is the warranty offered, notes d’Hotman Kotzen. Insisting on a15 to 25 year warranty certificate will determine how much faith the manufacturer and installer has in their cable. Of course, Wi-Fi is a great option to extend copper infrastructures in homes and other buildings. De Ru notes that modern Wi-Fi solutions are even better than before due to the introduction of MU-MIMO (multi-user, multiple-input, multiple-output) technology. Put simply, this technology allows an access point to service more than one user at a time without having to share the bandwidth – which results in better performance for users. For public hotspots, such as clubhouses, this will make a significant improvement to the Wi-Fi performance, and today Wi-Fi is something people expect to have wherever they are. CCA stands for copper-clad aluminium wire. It is a cheaper alternative to copper cabling made up of an inner aluminium core and outer copper layer. This type of cabling is used in many areas, including networking where it can replace traditional copper. However, some say that it is a cheaper and less reliable alternative as the aluminium core can affect transmission speeds. The argument is that aluminium has a higher electrical impedance versus copper and that aluminium is less flexible and tends to break more easily. Of course, network cabling is not something that is moved around a lot, and so breakage may not be such a strong argument against CCA. De Ru says Miro is aware of the uneasiness around CCA and has conducted its own tests on these cables. What Miro found was that traditional copper is more susceptible to spikes than CCA, making surge protection a must. In addition, when it came to PoE transmission, the difference between copper and CCA cabling was so small it was negligible. For those not convinced, De Ru refers to the ‘Skin Effect’ According to Wikipedia, “The skin effect causes alternating current to concentrate on the more-conductive copper cladding of the conductor, causing the resistance of the wire to approach that of a pure copper wire at high frequencies ….” De Ru says this means at high frequencies, the current is concentrated around the outer copper layer, by as much as 80% in Cat5 cable at 100 MHz. So, with the right quality of CCA cabling, one can save on costs while getting similar performance to traditional copper. Taking the above views into account, we asked the three interviewees to end off by providing our readers with their top three tips on what estates should consider when considering the challenges of networking their environments. 1. Determine the cost of cabling (both long term and short term). How much will it cost to install cabling now and maintain it for future years? Copper might be cheaper to install, but expensive to support. Fibre will be more expensive to install, but cheaper to maintain. Wireless networks, on the other hand, may alleviate many cost headaches in future. 2. Factor in reliability and scalability. Copper cabling might support today’s demand,but will it support the regular doubling of voice and data traffic in, for example, two years from now? Fibre supports much faster speeds than copper and will result in significantly fewer bottlenecks on the network. 3. Budget for on-going support costs. If an estate opts for copper cabling, there will most likely be future costs associated with losses due to theft and damage due to lightning strikes, to which copper is susceptible. d’Hotman Kotzen recommends estates use a certified installer, one who can produce documentation to prove their certification. In addition, she advises estates to ensure they obtain a warranty certificate on all the cabling installed. And finally, although it should be a standard practice, only use reputable companies you can rely on and that will be around in future when you need assistance. De Ru’s first recommendation is compatibility. When using wireless networking, make sure the frequencies of all your devices match (for example, 5.8 GHz), and make sure you obtain the latest wireless technology, not old stock that’s going cheap. As noted above, the demand for bandwidth is always increasing so make sure you opt for a Gigabit switch. Even if you don’t need it today, you soon will. Moreover, the price difference between a Gigabit switch and a 100 Mbps switch is not extreme. Finally, he recommends buyers don’t compromise for the sake of saving a few rand, the long-term costs can come back and bite you. He recommends estates stick to reputable brands that have a local support structure, and only work with service providers with a good reputation.